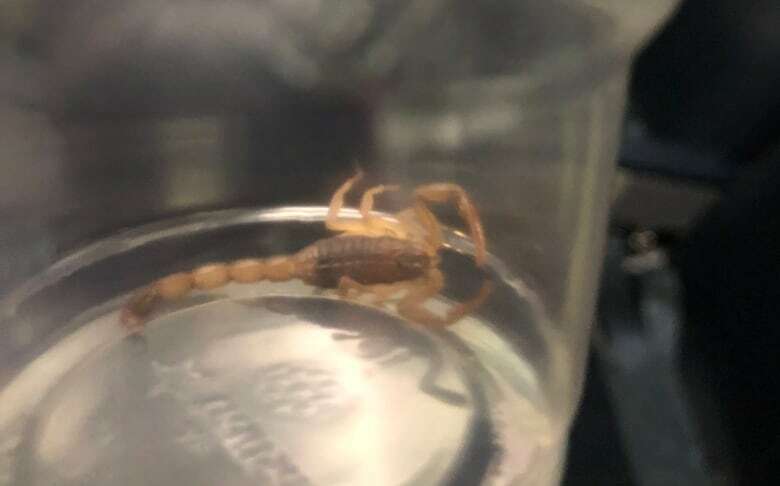 A woman on a flight from Toronto to Calgary said the lights had just dimmed for landing when she felt a piercing pain on her back and began "freaking out," forced to wear her seatbelt for minutes before leaping up to find a scorpion. "I just kind of ignored it," she said, thinking the air conditioning on the plane was blowing down her back. "As soon as the lights turned off again, closer to when we're literally about to land, I felt the piercing pain on my lower back, like, oh, my God, something bit me." She said she was freaking out, trying to grab her sweater, but couldn't take her seatbelt off to see what it was as the plane was landing. Maltais asked a flight attendant to explain what was happening. She said the attendant initially went back to her seat and found a gum wrapper, trying to tell her that's what had stung her. But Maltais told her to check again, so she did and then spotted the scorpion between the seats. Paramedics escorted her off the plane. EMS confirmed they responded to the airport at 10:30 p.m. and assessed Maltais, and she wasn't hurt. "I had a full-fledged panic attack … paramedics had to kind of keep me strapped to a heart monitor for a while cause I was just unable to calm down," she said. "Although this is an extremely rare situation, it can unfortunately occur. Our teams followed the protocols in place and a complete inspection of the aircraft, as well as an extermination process, were carried," said an Air Transat spokesperson in an emailed statement. The airline didn't say how, or where, the scorpion likely got on the plane. As for Maltais, she's a bit shaken but doesn't plan on letting the scare keep her from travelling. "Not so keen to go on a plane for a while, but definitely will not stop travelling. I definitely will check under my seat."